CAUTION: YOU ARE DEALING WITH WATER AND ELETRICITY! 1. BREAKERS: Should the electrical breaker throw to the tripped position, flip breaker back to the “ON” position. In the event that the breaker continues to throw, contact our office, there could be an electrical problem. 2. RESET BUTTON: (FOR PUMPS LARGER THAN 1 H.P.) The reset button is at the bottom of the control box. The control box will be about 7”x7”. Push the reset button until you hear a click. If it cannot be reset, contact our office. 3. PRESSURE SWITCH: A small gray box usually located at the tank, measuring 4”x3”. Ants, spiders and other insects can get between the points of the pressure switch and prevent contact of the points. WITH THE POWER TO THE PUMP CUT OFF, take a soft brush or air and clean the pressure switch. Ant powder can prevent insects from getting into the pressure switch. After cleaning the points and replacing the cover to the pressure switch, turn the power back on, and the system should begin to operate properly. If this does not work, contact our office. It is a good idea to put insect powder around the base of the pressure switch all year round to prevent insects from intruding. Never under any circumstance, turn off or close the valve located between the well and tank!! When a pump runs and the water has no place to go, the pump will burn up. A pump that is short cycling (running off and on rapidly) is not operating properly. Call our office and we will suggest several things for you to try. This can be a symptom of several different problems. Any time you can turn on a faucet and have no water, turn off the breaker to your well and check the items above. If you cannot determine the problem contact our office immediately. 1. Be sure that all exposed piping is wrapped. Inexpensive insulation materials may be purchased at a local hardware store or home improvement center. 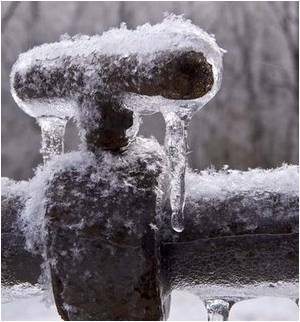 We also suggest that you wrap the pressure gauge and the small pipe beneath the pressure switch, as these will also freeze and affect your system. Be sure to keep all insulation away from electrical controls to prevent fires. A system that is enclosed in a well house may have an electrical heater put on it. Electrical heat tape is also available at a local hardware store or home improvement center. This tape is thermostatically controlled. Remember, if the incoming power is interrupted, the heat tape will not heat!! 2. At times that the temperature is predicted to be below freezing, leave pencil size streams of water running from the cold tap farthest from your system. This should protect the system and your inside plumbing as well. 3. Should the system freeze, cut the power to the well immediately. Piping, switches and gauges may be thawed by warming them with a blow dryer or other heating device, being extremely careful not to over expose any PVC piping to extreme heat. Taking the above precautions should preserve the water system. At any time you have any questions about your system, please feel free to contact our office and we will do our best to assist you.